I’m doing my part to help keep our rivers clean! Now, I call on manufacturers, businesses, and government to do your part to implement wide-spread change to stop trash before it starts. Plastic – including bags, bottles, and polystyrene (Styrofoam) – and tires are consistently the most found items during the Connecticut River Conservancy’s Source to Sea Cleanup and these items never fully break down. In 2017, Cleanup volunteers collected over 26,000 plastic bottles and over 1,400 trash tires. I’m sick and tired of trashed rivers! Instead . . .
Manufacturers, businesses, and government need to lead the way on overhauling how we make and use plastic – ban single-use plastic, use better types of plastic, make recycling easy, and keep Styrofoam out of our rivers by using better types of dock floats. Tire producers must take greater responsibility for the recycling and reuse of the tires they generate. Pushing the disposal cost of tires to consumers is a recipe for illegal dumping. I’m doing my part. It’s YOUR turn. I make good choices in how I purchase and dispose of products, and I helped remove over 1,000 tons of trash from the Connecticut River during the Source to Sea Cleanup. As your constituent and your customer, I want you to implement wide-spread change to stop trash before it starts. We all have a responsibility to solve this problem. By working together, we can make a real difference for our rivers. Why is plastic so bad for our rivers? 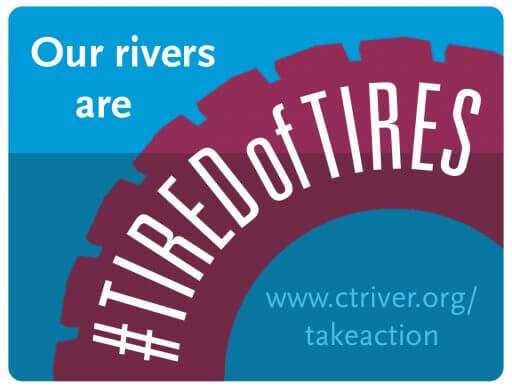 Why are tires so bad for our rivers? • Many towns have banned plastic locally and we applaud this. But these bans need to be state-wide to be most effective. • Some businesses have committed to eliminating foam and plastic from some of their stores and we applaud this. But businesses must implement these practices company-wide and hold all stores to the higher standard. • Bio-plastics are emerging as a promising alternative to plastic made from fossil fuels and should replace conventional plastic. These new plastics are compostable, break down in the marine environment as food, are made from waste, and are made with less energy and environmental impact than traditional petroleum plastics. • It’s time that legislators pass laws to make recycling easy and widely accessible by using effective incentives like Bottle Bills for recycling aluminum, plastic, and glass containers. • Get rid of polystyrene (Styrofoam) foam dock supports in favor of enclosed foam or non-foam dock materials that won’t send plastic bits into rivers. • It’s time legislators and tire producers embrace more widespread Extended Producer Responsibility (EPR) programs, which lead to free, easy disposal of tires and eliminate or reduce the incentive for illegal dumping. EPR programs have been successful across the country and the world to turn waste into a reusable commodity. These programs also include advanced market development, which can increase the value of post-consumer materials and provide opportunities for economic development. Make a bigger impact. Share this! 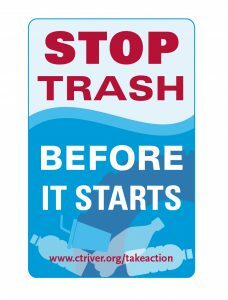 Help show just how big a problem trash is in our rivers! Take photos of the plastic & tire trash you find. 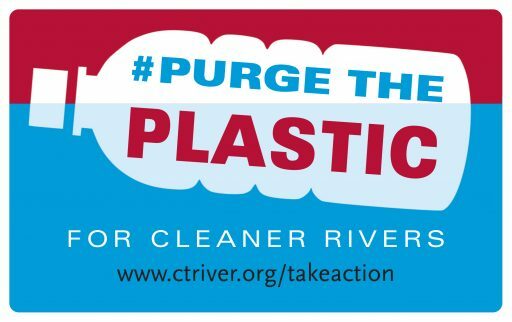 Share photos online using hashtags #TiredOfTires and #PurgeThePlastic. Tag your local elected officials. Tag the companies whose logos appear on the trash you find. CRC’s annual Source to Sea Cleanup photo contest has ended but check out the great photos! 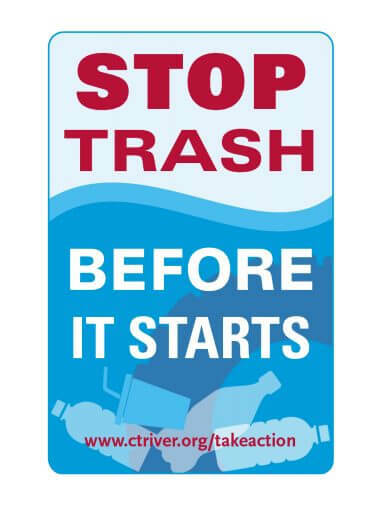 Learn more about trash laws in your state, how you can get involved locally to help stop the flow of trash, and what CRC is doing with the petition and trash photos. Join us for an informal chat about trash and our local waterways. Open to everyone! February 7, 2019 6:30-8pm CT Valley Brewing Company, South Windsor, CT. Register here. March 13, 2019 5:30-7:30pm Northampton Brewery, Northampton, MA. Register here. March 13, 2019 5:30-7:30pm Skinny Pancake, Hanover, NH. Register here. March 19, 2019 5:30-7:30pm Windsor Station Restaurant and Barroom, Windsor, VT. Register here. Sign up to receive CRC’s Action Alert emails. You’ll be notified whenever there is urgent action to take in your state.